Camp Wind Cave was located southeast the cave entrance in Wind Cave Canyon. Only a few hundred yards from the entrance to the cave, it was protected by the hills of the canyon. The camp was built in a crescent shape partially encircling the water reservoir. 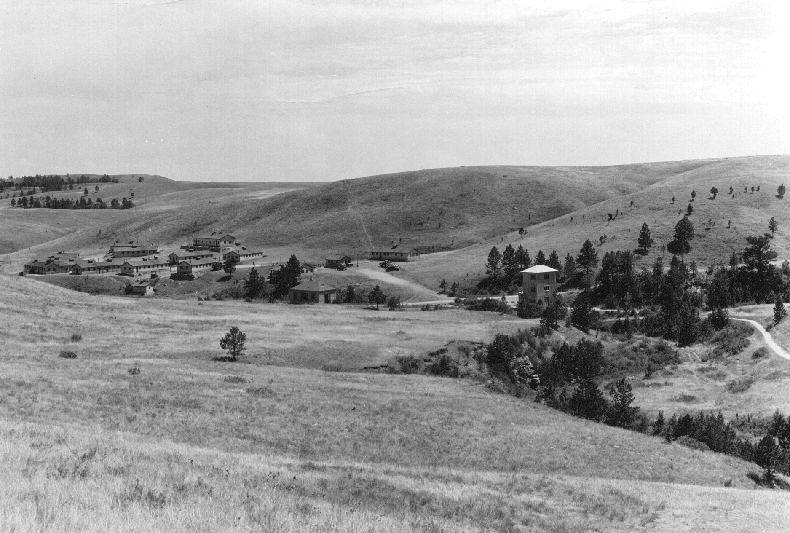 The side hill gave good surface and sewer drainage, and the 5,000-gal reservoir perched on a hilltop 140 ft high provided an ample supply of water a pressure that would never be needed. The sewage disposal system was connected to that of the national park (1935). 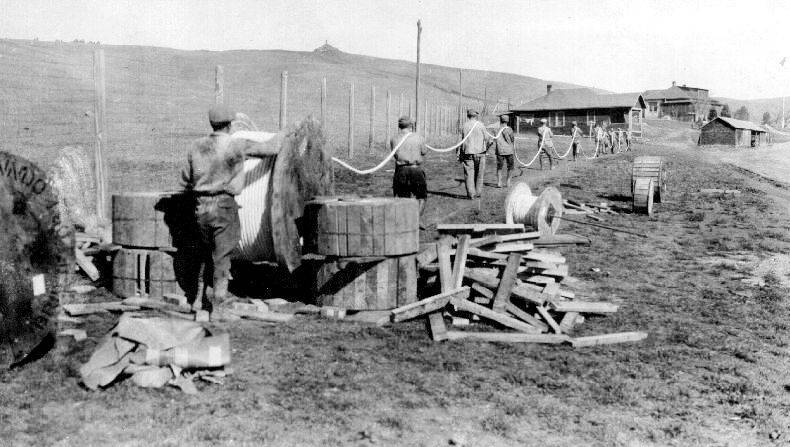 The camp originally contained 18 buildings--eight barracks, bath house, mess-kitchen building, hospital, recreation hall, headquarters, officers' lodge, latrines, and garage. The recreation hall, flag pole, mess hall, and garage were built in a straight line running north and south. The other buildings formed a double row of arcs on either side of this line (1935). The recreation hall was built on a side hill with a high wall facing the camp. A large heart-shaped stone was embedded in the wall (1935). The officers' lodge was still intact and being used by the park service in 1986. 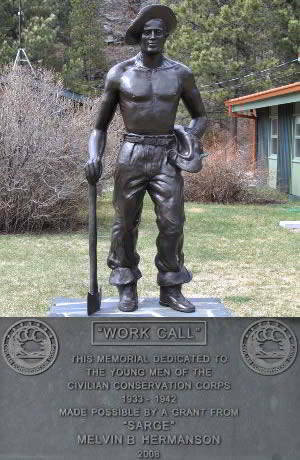 Camp Wind Cave was part of a national CCC program to improve the nations park system. Supervised by the National Park Service enrolees developed Wind Cave National Park and Jewel Cave National Monument. In Wind Cave CCs renovated tour trails and installed the 208 foot elevator shaft and building, concrete steps and indirect liqhting. They constructed the Park water and sewer systems, parking area, stone guard rails, 18.6 miles of big game fence, the pigtail bridge and several smaller ones and several miles of road. 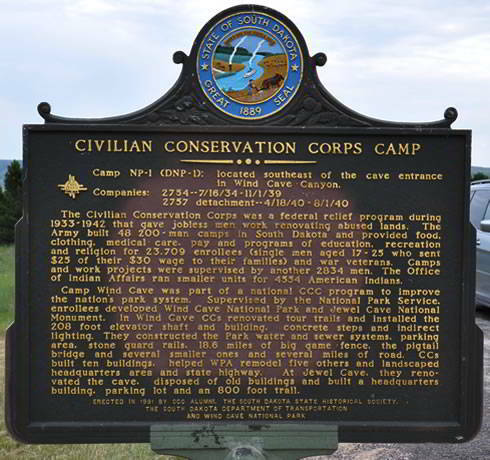 CCs built ten buildings, helped WPA remodel five others and landscape headquarters area and state highway. At Jewel Cave, they renovated the cave, disposed of old buildings and built a headquarter building, parking lot and an 800 foot trail.